Alice Senoh has spent her whole life living in her sister Mayura’s shadow, and much as she looks up to her, it can be hard not to get frustrated at times. Finally, matters come to a head when Mayura starts dating the boy that Alice likes; unable to contain her jealousy, Alice wishes for Mayura to disappear- only to be horrified when she does indeed go missing. As Alice later learns, the power of words is not only a very real and tangible one, but something that she must master if she wants to retrieve Mayura. With the help of magical rabbit Nyozeka and Mayura’s boyfriend Kyou, Alice begins learning about the Lotis Words which will be needed to save Mayura from the darkness she is now trapped in- but will Alice’s feelings for Kyou interfere with her mission? 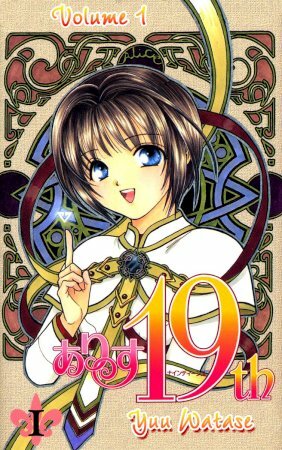 Yuu Watase is well known for her bishounen-filled romance stories, but up until now, I had generally enjoyed her work- Fushigi Yugi’s light entertainment made for a good starter series and Ceres was an interesting mix of drama, fantasy and romance. With that in mind, I was looking forward to trying Alice 19th; an unfortunate fact given that the series turned out to be an entirely disappointing experience. Alice 19th’s main problem is that it doesn’t seem to have much idea of what it wants to achieve; within the space of its seven volumes, the story meanders from one plotline to another, without doing a good job of developing any of them. The opening “girl, boy and magical mascot use destined powers to battle the darkness in people’s hearts” chapters are formulaic enough, but the series only goes downhill from there. New characters are introduced far too late in the story to get any development; the enemy is revealed to be a generic Lord of Darkness seeking to destroy the world for no reason, whilst the Lotis system of randomly shouting out words to attack is completely arbitrary more than a little ridiculous. For the majority of the series, our heroes only learn about six of the twenty four Lotis words, but after some unseen training and a few boss battles at the end, they have somehow learned the rest. As poorly plotted as the story is, it is by no means helped by the somewhat insipid and generic cast. 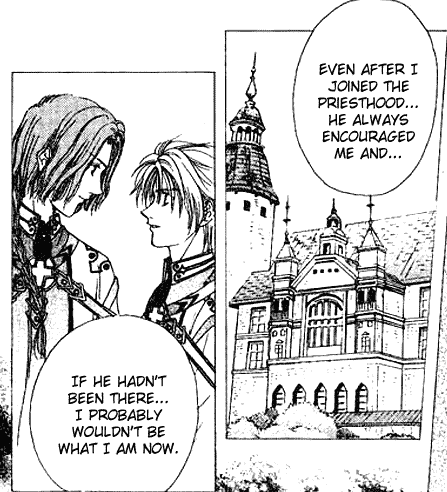 As mentioned above, most of the supporting characters do not appear enough for readers to learn much more than their names, but even the leads are none too inspiring- there’s determined and angsty Alice; bishie love interest Kyou, the ‘perfect man’ with a tediously tragic past, and Frei, a European Lotis master and ladies’ man whose back story is unimportant enough to be relegated to the last few chapters. As much as you may want to like them, it is near impossible to- they are simply too bland and simplistic to engage with. As indicated by the title of this piece, one thing that Alice 19th does have going in its favour is the quality of its artwork. Yuu Watase is no stranger to creating aesthetically pleasing character designs, and this series showcases some of her best and most polished work. Settings and backgrounds are also solid- locations such as a final boss castle filled with ugly monsters may be completely unoriginal, but at least they are well drawn. Unfortunately, as enticing as they are, the visuals ultimately cannot compensate for the complete lack of worth of the core aspects of the series. It may look pretty on the surface, but deeper down, Alice 19th is a bit of a mess- a blend of the monotonously unoriginal and the nonsensically arbitrary, this is one series better off left well alone. Frey explains how Eric’s HARD GAY helped him through some difficult times. This entry was posted in Manga and tagged Yuu Watase. Bookmark the permalink.